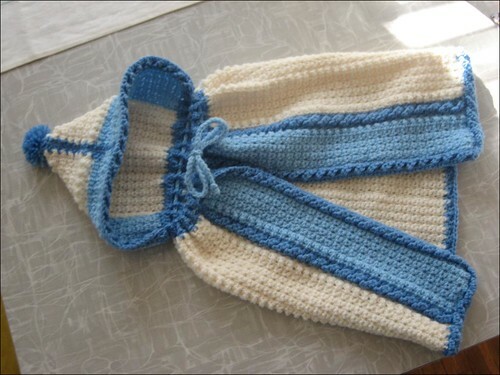 Rounding out my finished projects for 2007 is crochet project #14, the baby cape. This cape is going to a baby due in cold and snowy Wisconsin January. I’m hoping the hooded design will make for an easy wrap and hold for a little extra baby warmth. Meet Isabelle, my first crocheted animal. I finished her around the end of November but have been keeping hush until I could present her to her new owner, my sister. She’s made from left over scarf yarn. Her eyes were rescued by SB, from my grandmother’s sewing kit. I decided she should only wear pink to compensate for her darkness and designed the cape, complete with ear holes. There’s something about putting a face on an object that can change your whole understanding. Once I finished her I realized she was Italian. Being an Italian bunny obviously means she eats only gelato and always looks fabulous. Six days, three Christmases and 2000 miles. This year Christmas held changes at every stop and left me wondering what to hold on to and what to let go. After 24 hours with friends in Milwaukee and Madison we settled into our shiny new guest room at my parents’ house for one night. Only this Christmas I was an only child, me, me, me! My sister was left to her own devices in San Francisco. SB did dilute my only child stardom, but I guess that’s OK. We decorated cookies, ate cookies and Christmas bread and an accidentally vegan dinner. Yum! We threw out all pretense and opened all our presents on Christmas Eve, giving Christmas morning a very leisurely pace. By two we were on the road in our rental car, racing the “mixed precipitation” turning to snow as we drove three hours north to SB’s hometown. Minutes after we arrived the snow started piling up and the wind increased to forty plus mph. That night began the Christmas traditions of my new in-laws. Christmas Eve we all congregated for a snacky dinner including turtle bread filled with spinach dip. SB’s family has almost doubled in size in the past year, going from 6 people to 11 people, including two grand children. This was by far our biggest celebration. Christmas day found us completely snowed in, with over a foot of snow piled against the door. SB spent two hours shoveling before the rest of the family arrived. After a butter-licious dinner and more cookies, we tried a new gift exchange, based on drawing names and randomizing small gifts, with much success. All present opening halted mid-rip as a diaper pit stop was required. After all gifts were exchanged, a few rounds of games were played. Ending our second Christmas snuggly tucked in against the cold. The next morning we were off to begin our third Christmas eve, this one on Dec. 24th. We drove four hours south to Milwaukee, boarded a plane and two hours later were back in the ATL. Back and starving. A swing through our local shopping area at 7pm in search of tacos or frozen pizza or something, left us empty. All stores had closed an hour beforehand. We made a final drive through our local neighborhood, finding all the restaurants closed save one, the rock-n-roll bar. Yay! We pulled in and ordered delicious burgers and beer. Onion rings never tasted so good. The place was nicely busy, filled with the usual black clad, grungy crowd. No Christmas music to be heard. It felt just right. Christmas day was spent entirely in our jammies, eating lasagna and cherry pie. I was happy that for our first married Christmas we were able to squeeze in so many traditions from both our families and start to make some of our own. Do you have an extra large head? Have puny “average” sized hats left your ears cold? Perhaps you have a normal size head but you like your hats big and loose. Based on a chunky ribbed hat pattern from winged sheep, here is a knitting pattern for a hat to please your giant head. Loosely cast on 84 stitches. Rib stitch rows around until your tube measures between 5 and 6 inches tall. Begin decrease, changing to the double pointed needles when needed. Cut the yarn leaving a generous tail. Using a finishing needle weave yarn through remaining loops and cinch together, pulling the small opening closed. Tie off and weave in ends. The matching scarf pictured above was made using 2 skeins Malabrigo chunky merino wool plus remaining yarn from hat. Using size 10 needles, circular or straight, cast on 36 stitches. Rib stitch (k2, p2) in rows until all yarn is used. Weave in ends. Malabrigo yarn comes in great colors. Our Christmas Cactus is giving us a splendid show.